Once again, I'm amazed that one of my most-reached-for optics on the New York trip was the $98 Olympus Fisheye Body Cap 9mm f/8 lens. 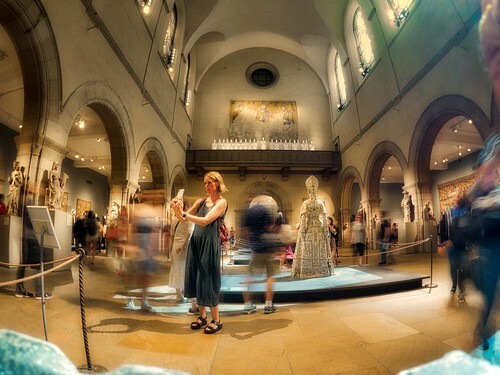 "Inside the Met" - I was able to set the Olympus OM-D E-M5 Mark II on a solid surface and capture this long exposure with the 9mm fisheye. ISO 1600, 1 second exposure, f/8. Photo by Derrick Story. Sometimes the world is just too big, or spaces are just to cramped for a standard lens. And the key factor that the Olympus body cap has going for it is that it's just so darn compact. It will always fit in the bag. So, if I'm standing there inside the Met, outside in front of One World Trade Center, or at the pedestal of the Statue of Liberty, I can create the image that I see in my mind. And to tell you the truth, the image quality is surprisingly good. If you're a Micro Four Thirds shooter, and you don't have the Olympus Fisheye Body Cap 9mm f/8 lens in your bag, you're missing out on some excellent artistic opportunities. I promise you. 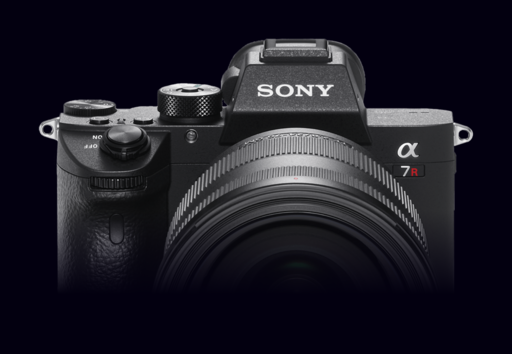 Sony just announced it has sold more full-frame cameras than any other brand in the US over the past six months, measured both by units sold and by value. In part, this is because, as we all know, Sony cameras are top notch. But it's also because they have more recent releases in this category. On August 23rd, Nikon will announce their full frame challenger, with possibly some very interesting lenses on the road map. Make no doubt about it, Nikon realizes the importance of the moment. My prediction is that their entry will be formidable. And let's not forget about Canon. It is quiet at the moment, other than a few snorts from the sleeping giant. But once we work through the Nikon announcement, we will hear from them. And like Nikon, Canon realizes that there is little margin for error. Why is all of this full frame thunder so important? Ultimately, it's bragging rights. 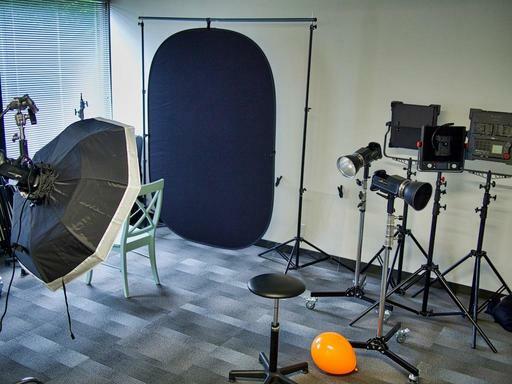 The psychology of camera brands is that if you satisfy the pro, the enthusiasts will follow. If you see Canon lenses on the sidelines of the Super Bowl, that is a stamp of approval for thousands of amateur photographers who will follow in that wake. Pros shoot full frame. What they choose is of vital importance to all three brands. Personally, I'm not a big sensor guy. It's not necessary for my work. I would rather have smaller, lighter lenses. And since I don't have a dog in this race, I'm really going to enjoy the show. Photokina begins on September 26. PhotoPlus Expo follows the next month on October 25th. During that stretch, Sony will impress upon us of their current dominance, Nikon will remind us of their tradition of greatness, and Canon will take them both on. What a fantastic way to close out 2018! This is The Digital Story Podcast #648, August 14, 2018. Today's theme is "Is the Panasonic TS7 as Smart as it is Tough?." I'm Derrick Story. When I first laid eyes on the Panasonic TS7 digital camera, I knew I had to get my hands on it. And once I did, it felt every bit as good as I imagined. But once you get past its rugged good looks, how does it perform? Does it have the brains to match the body? This is the question that I'll address in today's TDS Photography Podcast. Is the Panasonic TS7 as Smart as it is Tough? The Panasonic Lumix DC-TS7 is no lightweight, that's for sure. It feels like a crush-proof camera that can be submerged 100' below the surface of the ocean. And it packs some pretty powerful specs as well. But in the field, does it live up to its promise? Now, let's talk about how those features actually worked. And if you're an Inner Circle Member via Patreon, I have a fun video waiting for you that shows you more of what I've discussed here. Jump over there and take a look. I was reading a Steve Huff article titled, Amazon 1dX II Scam Update where he was following up to an earlier article about being scammed via Amazon for a Canon 1DX order. 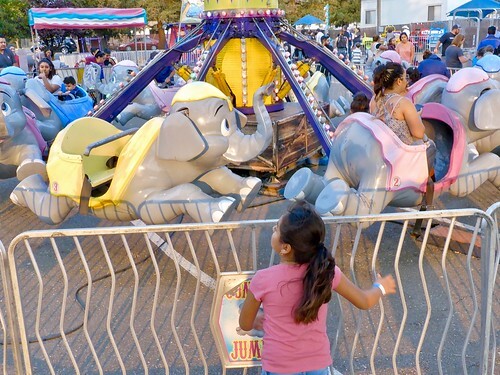 But a funny thing happened along the way that caught my ear. The Canon 5D, which Strong calls "arguably the best deal in photography" when paired with the 50mm f/1.8 II lens, was a camera that helped full frame cameras break into the mainstream. It was the first full-frame DSLR in a smaller, standard camera body and its price tag of $3,300 also set a new standard for how affordable full-frame cameras could be. The camera is 13-years-old now and can be purchased used for about $350 these days. Pair it with the 50mm f/1.8 II (which costs about $75 used) and you have yourself a full-frame DSLR kit for around $400. 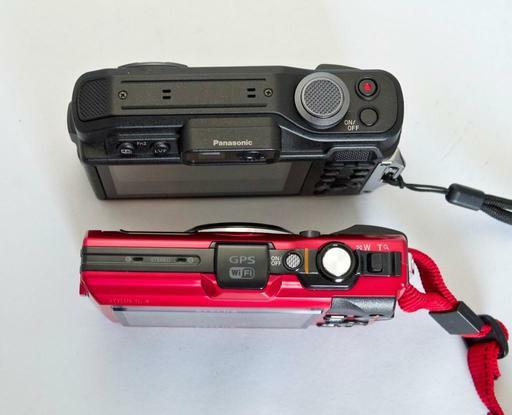 When the Panasonic Lumix DC-TS7 was released, it reopened the debate for which rugged compact I would pack for my outdoor adventures. Would the TS7 dethrone my current favorite, the Olympus Tough TG-5? Side by Side - Panasonic TS7 on the left with the Olympus Tough on the right. 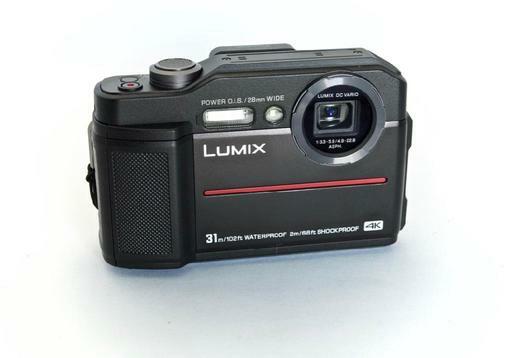 With the Panasonic, I would get more resolution (20MP vs 12MP), greater zooming range (28-128mm vs 28-100mm), an electronic viewfinder, and a higher resolution LCD back screen. Both cameras have 4K video recording, but the Panasonic has the 4K Photo mode. So I carried the TS7 around with me for a couple weeks of summer activity. The Jpegs still images were very good. (But, I was surprised that I did not have a RAW option like I do on the Olympus Tough.) I particularly liked the the burst mode in 4K Photo. In this mode I could capture at 30fps, then choose the frame that I wanted for the still image at 8MP resolution. This was my favorite feature on the Panasonic. It's fun and effective. I was also looking forward to the 4K video capture. But I had a difficult time focusing. Once I started the video recording, the camera seemed to have a mind of its own in terms of choosing focus point. This could be due to my lack of experience with the device. But even when I sat down and tried to figure it out, I still walked away with clips that were not sharp. This was my most disappointing feature with the TS7. The electronic viewfinder is visible on the black TS7. The Olympus doesn't have that feature. Instead, the GPS module sits atop the camera. The built-in electronic viewfinder was a welcome addition. I didn't use it as much, however, as I thought I would. In part, that was because the high resolution LCD was quite good and convenient. Also, the EVF is a bit small and not that enjoyable for composing. So for me, the electronic viewfinder is in the category of nice to have when I need it, but not much beyond that. So what's the bottom line here? Am I going to switch from the Olympus to the Panasonic for my adventure compact? No, I'm not. Here's why. 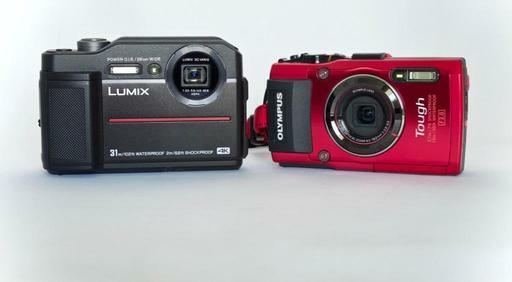 Both cameras are tough and waterproof. So I can take either anywhere. 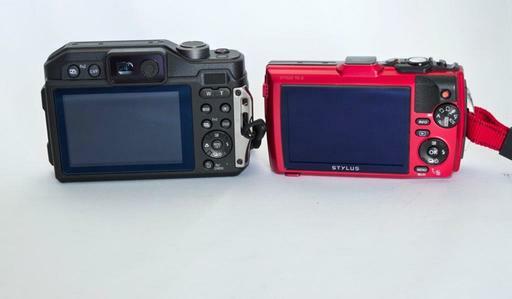 But with the Olympus, I get RAW format, realtime GPS geotagging, smaller form factor, and a faster maximum aperture. 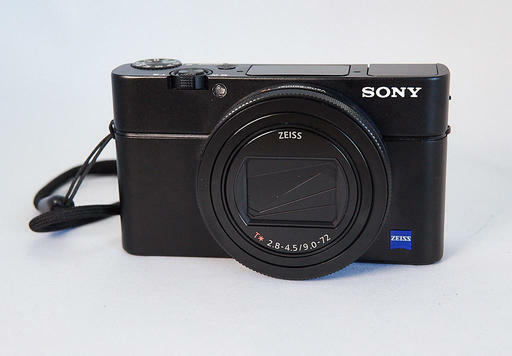 Plus, the TG-5 is $379, $60 less than the TS7. There were definitely things that I liked about the Panasonic TS7. I like its handsome good looks, viewing options, and the wonderful 4K Photo mode. But I struggled with its video capture, and I do miss having RAW for hard-to-tame contrasty lighting - something that I seem to encounter often during summer adventures. Also, the built-in geotagging that the Olympus provides is top notch. I don't have to do anything, and the location data is added to my shots. The Panasonic has a feature that lets you add tags via your smartphone. It's not the same by any means. So, would I discourage someone from choosing the Panasonic Lumix DC-TS7? Absolutely not. It's a good camera that has a lot going for it. It's just not my favorite of the two. 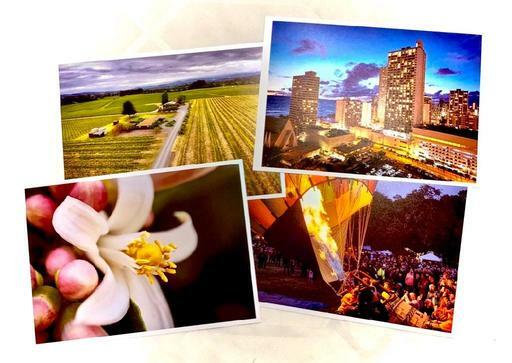 Should You Invest in a 2012 Photo Printer on Sale? It's tempting, isn't it? 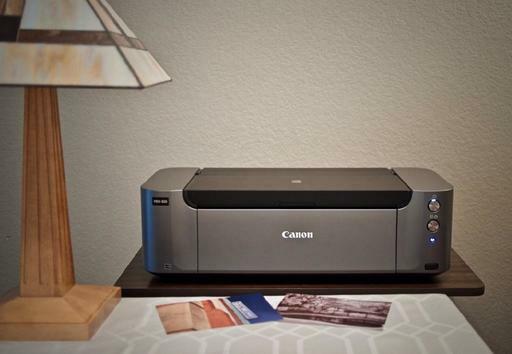 The Canon Pro-100 13" photo printer released in 2012 for $499 is available now for just $119 after rebate. That's a pretty big savings for an output device with a 4.5 star user rating on B&H Photo's site. As you may recall, I took the Canon Rebate Challenge, and they did indeed deliver my $250 Mastercard gift card. So, that leaves us with the investment itself. In terms of actual prints, I think the Canon Pro-100 printer is worth every penny. When I send a job its way, the Pro-100 gets right to work and produces beautiful output. I can connect with it via USB cable, WiFi, and AirPrint. It doesn't seem to care which method I use to send data. It just works. When Canon releases their new 13" photo printer, which they are sure to do soon, I would expect certain upgrades. For example, there will be a nice LCD screen on the device to assist in setup and use. With my older Pro-100, communication requires a computer and the proper Canon software. An LCD would be a highly welcome feature. They may be improvements in the dye technology. New ink formulas are possible, for sure. How will they impact what emerges from the printer, who knows? Chances are reasonable that it would be hard to tell the difference between actual output without knowing. The latest Canon multifunction printers include goodies like Alexa commands. That, I couldn't care less about. Although, I would like more printing options via the existing AirPrint technology. But there is one thing that I know for sure. Thanks to the great Pro-100 deal, I'm making prints right now. And that's definitely worth a lot to me. 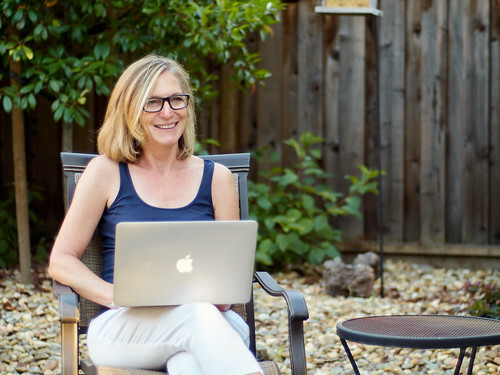 This is The Digital Story Podcast #647, August 7, 2018. Today's theme is "Digitizing, Printing, and More!." I'm Derrick Story. I guess you could say that I'm a 2-way photographer. In one direction, I'm keenly interested in making prints from my digital images. Going the other way, I'm fascinated by methods for digitizing my analog shots. And in today's TDS podcast, I talk with Peter Krogh, author of "Digitizing Your Photos". Plus I share my first experiences with the Canon Pro-100 and Red River's Polar Luster Metallic paper. What a show! Peter's book, Digitizing Your Photos with Your Camera and Lightroom is a cornucopia of helpful information for developing an efficient and high quality workflow for scanning analog content. 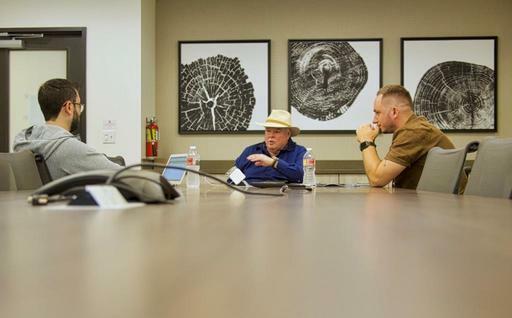 I sit down and talk with Peter during the first segment of today's show. Now that I have my rebate, it's time to start printing with the Canon PIXMA PRO-100 Wireless Professional Inkjet Photo Printer . It's still on sale until the end of August with a $250 rebate, resulting in a final price of $119.99. After my first day of printing with it, here are my pros and cons. I've never used inkjet stock like the Red River Polar Luster Metallic 255. The luster surface with the metallic base create a compelling look that is magical under direct lighting. 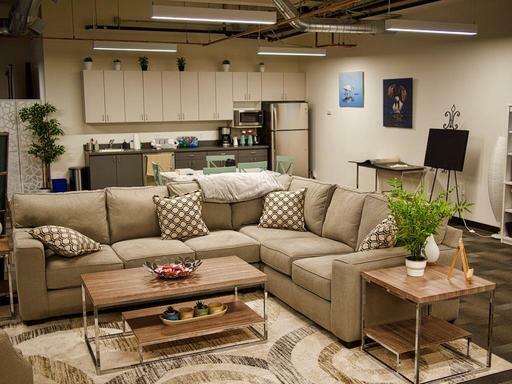 In fact, I'm adding a new light set up to my studio just for these prints. More on this during this segment of the show. 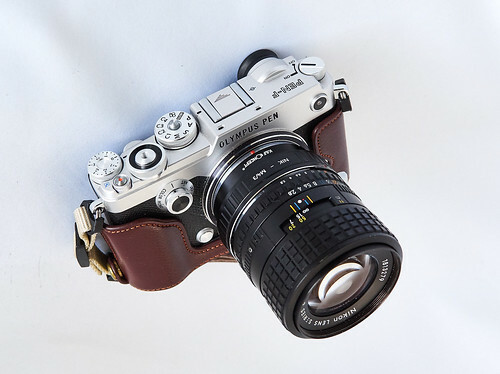 Mirrorless cameras in general, and Olympus Micro Four Thirds bodies specifically, are excellent hosts to vintage SLR optics. But just like everything else in life, some matches are better than others. Olympus PEN-F with Nikon Series E 50mm f/1.8 "Pancake" lens. Photo by Derrick Story. A particularly good combination are the Nikon Series E optics with, in my case, the Olympus PEN-F mirrorless camera. 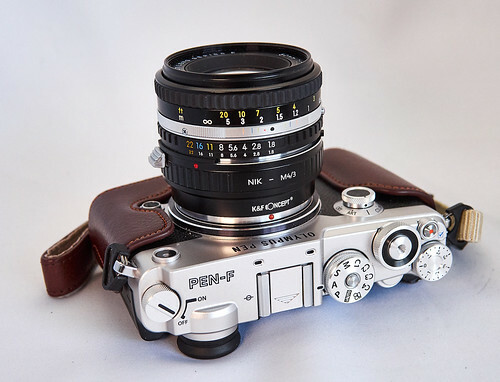 Not only does the styling of the PEN-F look good with these lenses, it also has specific settings to facilitate the use of these older optics. The Nikon Series E lens family has an interesting history. They were originally introduced the 1980s to accompany the new line of compact Nikon bodies, including my favorite, the Nikon FG. Both the Series E lens family, and the FG were designed to be light and versatile. But traditional Nikon shooters generally criticized the tandem as too lightweight and not deserving of the Nikon nameplate. Turns out, at least in my opinion, Nikon was ahead of its time. The FG is intelligent, easy to use, and not much bigger than my MFT cameras. My favorite Series E optics include the 50mm f/1.8, 35mm f/2.5, and the 100mm f/2.8. They are sharp, light, and mount beautifully on mirrorless bodies. Olympus PEN-F with Nikon Series E 100mm f/2.8 portrait lens. Photo by Derrick Story. For my Olympus PEN-F, I'm using an affordable K&F Concept Lens Mount Adapter ($22) that's well-machined and provides a snug fit. 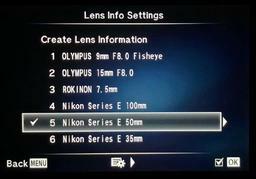 The PEN-F even allows me to write lens metadata to the file at time of capture using its unique Lens Info Settings menu (Gear K > Utility > Lens Info Settings). I can create a profile for each non-digital lens that I use, and the PEN-F will include its metadata with the rest of the file info. It's so cool. I've programed a function button on the PEN-F to bring up that menu so I can quickly change the profile when I switch out lenses. Because of the cropped sensor, I use the Series E 50mm as a 100mm optic, and the Series E 100mm as a 200mm telephoto. Their compactness makes it easy to include them in my carry-around kit. 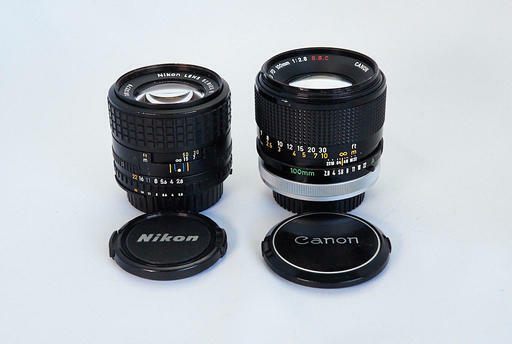 Here's a comparison of the Nikon Series E and Canon FD 100mm optics. The Nikon Series E 100mm f/2.8 next to the Canon FD 100mm f/2.8. And the weight difference is even more dramatic. The Canon tipped my scale at nearly 13 ounces, and the Nikon weighed in just over 7 ounces. When you're a Nimble Photographer, those differences really add up. At this point, it's time to talk about the images themselves. I really like the Series E 50mm for portraits. I shoot with it wide open at f/1.8. It provides a flattering sharpness at the point of focus, with softened tones in the foreground and background. Here's a portrait of Theresa working on the back patio using this combination. I captured in RAW with the PEN-F and processed it in Capture One Pro 11. I didn't use any sharpening or softening adjustments - just let the image stand on its own so you could see the character of the lens/camera combination. "Theresa Working in the Backyard" - Olympus PEN-F with Nikon Series E 50mm lens set to f/1.8. Photo by Derrick Story. If I told you that this new portrait lens setup was available for less than $100, you probably would think that's a mistake. But it isn't. And that's the beauty of using vintage lenses with cameras that are truly designed to accommodate them. It's the creative gift that just keeps giving. 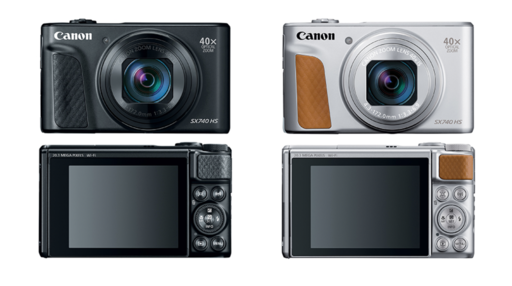 For those times that you want 4K video, but don't want to part with your favorite camera that doesn't support it, Canon offers the PowerShot SX740 HS for $399. The release of this camera is interesting to me. It seems designed to fill gaps in a traditional photographer's kit by offering 4K video and 4K time-lapse at a somewhat affordable price. And since it doesn't take up much room in the camera bag, the SX740 can quietly augment your existing toolset. I have no idea if this strategy will be effective. But in the age of dying low-end consumer compacts, it seems worth a try.